Munson Healthcare recognizes individuals and organizations in our community who contribute significantly toward improving the health and wellness in the communities we serve. These are our Community Health Heroes. Address the unmet health needs of the uninsured, underinsured and disenfranchised. Address the unmet or emerging health issues of the youth and elderly. Focus on chronic disease prevention and management. 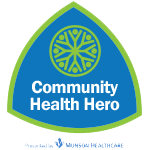 Please complete the following form to nominate your Community Health Hero. Our Community Health Committee will review all nominations and select the award recipients that best meet the criteria listed above.